It’s not often that I see a new tool or gadget and ask myself why someone hasn’t come up with this thing sooner. When Derek Pater emailed me and asked if he could send me his latest invention, Roofing Protractor, to review I was a bit skeptical. However, I never turn down a product to review so I asked him to send it along. The Roofing Protractor is a relatively simple device that takes a rather complex concept and makes it much easier for the average do-it-yourself carpenter. 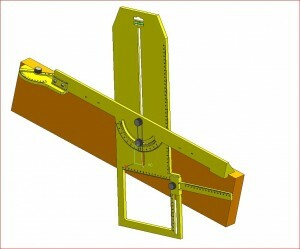 The roofing protractor is used to lay out roof rafters. While most seasoned carpenters can lay out roof rafters with a simple speed square most DIY folks have a hard time with the concept. As you can see in the short video below the roofing protractor is used to layout and cut roof rafters including the plumb cut, birds mouth and other basic features of a rafter. Derek was kind enough to send me the plastic version of the Roofing Protractor. Although the plastic version is quite usable I’d prefer buying the metal version once it’s available (It’s currently under final design and will be available soon). I also think this device would be quite useful for experienced carpenters because it certainly speeds up the process of laying out rafters and it helps minimize errors which result in wasted material. The next time my crew is building a house with rafters we’ll put it to the test. I’ll have an experienced carpenter give it a shot and also an apprentice with little experience laying out and cutting rafters. It should be interesting to see how easy it is to use for someone with little experience. The really nice thing about the plastic version is it offers a very reasonable price point for a device that most DIY folks might only use a couple times. It would be very nice to walk into a local hardware store and pick one up next time you’re cutting rafters for a shed or new porch. Until this great new invention reaches the US you can buy one online from Derek’s site, Real Inventions. I am the Inventor of the Roofing Protractor and have provided some weblinks that are great for different Roof Rafter design below,the first one is the best site for the mathimatic’s for Roofing.The Roofing Protractor is a 3 Dimentional Protractor that can setout almost any timber Size Rafter or Rafter angle Required.all requirements with one setting of this new product,Birdsmouth positions,plumb cut,side cuts and built in level to find angles. Where Is The Link To Buy The Roofing Protractor?